Preheat oven to 450 degrees. Cut carrots in half (or into quarters) lengthwise, then cut crosswise into 2-3 inch pieces. 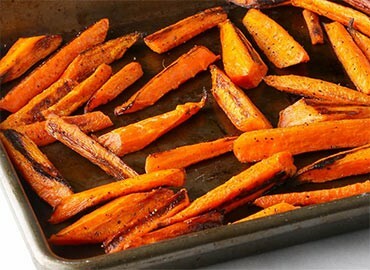 Toss the carrots with the butter and the oil and spread them out evenly onto a baking sheet. Season with salt and pepper. Roast until carrots are golden brown on one side, toss and continue roasting until tender, about 15 minutes in all.